Morgan Nelson follows through. The senior is one of many returning starters for NU. Last year, Northwestern enjoyed its best season since 2008, finishing 38-19 and advancing to the championship game of both the Big Ten Tournament and the NCAA Athens Regional. Expectations are high for the Wildcats to repeat that success in 2019. 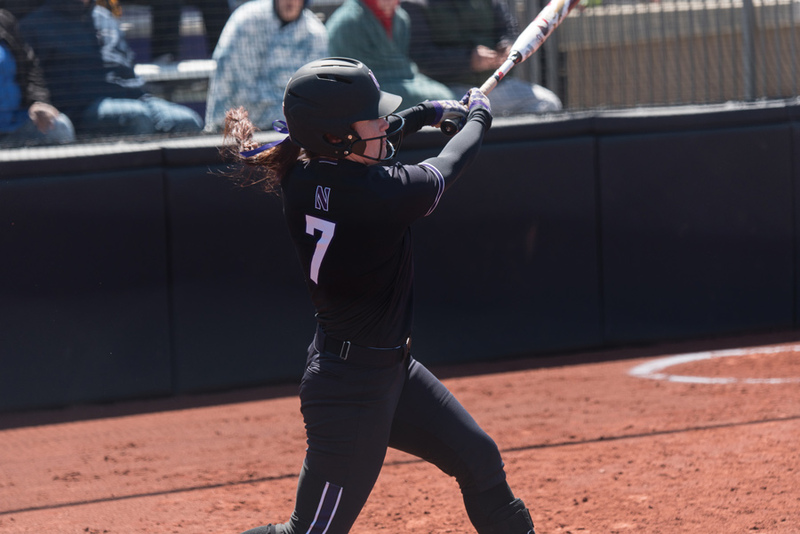 Despite losing a strong senior class that included speedy center fielder Sabrina Rabin, catcher and emotional leader Sammy Nettling and shortstop Marissa Panko, NU returns plenty of talent. The Cats bring back their top two pitchers from last year, sophomore Kenna Wilkey and junior Morgan Newport, as well as their two main power bats, sophomore second baseman Rachel Lewis and senior left fielder Morgan Nelson. NU should have plenty of offensive firepower, with Lewis and Nelson anchoring the lineup. Lewis hit .351 last year with 17 home runs and a Big Ten-leading 64 RBIs en route to being named an All-American. Nelson, who like Lewis was named to the all-Big Ten first team, hit .348 with 13 homers and 50 RBIs. The Cats also return senior first baseman Lily Novak, who was named to the all-Big Ten defensive team a year ago, and sophomore third baseman Mac Dunlap, a stellar defender in her own right. On the pitching front, Wilkey emerged as NU’s go-to pitcher last year, finishing 20-7 with a 3.51 ERA. Newport was forced into a larger role after a season-ending injury to now-senior Kaley Winegarner, and although she had ups and downs, she still had a solid season, going 14-8 in the circle with a 3.57 ERA. The Cats will also get Winegarner, their top pitcher in 2017, back this year, and are adding freshman pitcher Danielle Williams, who had an ERA of 0.79 or lower every year in high school. Drohan said she wants the pitchers to be ready for any role — starting, middle relief and closing games. Wilkey and Newport also contributed offensively last year, with Wilkey ranking third on the team with six home runs. NU traditionally schedules a tough preseason schedule, and while that is not as much the case this year, the Cats still have matchups with two 2018 Women’s College World Series participants: No. 3 Washington and No. 4 Oklahoma. In the conference season, NU will face No. 21 Minnesota, which beat the Cats in the Big Ten Tournament title game last year, as well as perennially tough teams Nebraska, Wisconsin and Illinois. The Cats open the season this weekend at the Titan Classic in Fullerton, California, playing five games in three days. NU will play Utah State and Pacific on Friday, Louisville and Loyola Marymount on Saturday and Idaho State on Sunday.